Mohamed Salah insists his sparkling form for Liverpool is simply down to the confidence he arrived at the club with. 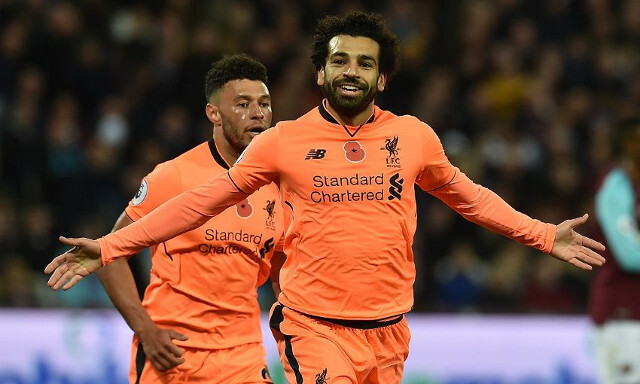 The Egyptian’s brace in Saturday’s 4-1 win over West Ham moved him to 12 goals in 17 games across all competitions for the Reds- just two behind Philippe Coutinho’s team-high tally of 14 in 2016/2017. Salah arrived on Merseyside during the summer and has since been a revelation as part of Jurgen Klopp’s counterattacking setup. The forward hasn’t put his emphatic start down to just his frightening pace or attacking movement, but instead his mentality. “I had confidence from the beginning. I was happy to come here,” Salah told BT Sport. Salah is already within touching distance of registering the highest individual goal tally in a season from a Liverpool player since Luis Suarez’s prolific 31-goal 2013/2014 campaign. He has taken no time at all in striking up a formidable understanding with the likes of Coutinho and Sadio Mane, combining with the latter in giving Liverpool incredible speed on the break. Moving beyond 20 goals for the season remains a real possibility, especially when considering the playmakers he is surrounded by. £34million? £36million? Whatever the fee, Salah has been a bargain.